Quiltville's Quips & Snips!! : Boxy Stars in Amherst, NY! This is my first time in Amherst, NY – the home of the Buffalo Niagra Heritage Museum, and the Amherst Quilters Guild! 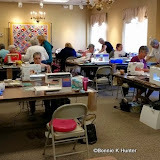 Apparently this September event has been going on for nearly 40 years with quilters gathering from all over the area, and crossing the border from Canada, to come for 4 days of workshops and instruction and quilting, sewing/chatting, laughing, talking, eating, quilter-shipping good times. The ladies came as soon as the doors were opened to start setting up machines, hauling in boxes and crates of prepared fabrics, greeting friends they hadn’t seen since last year’s event and bringing all the excited energy with them ---it’s a good thing! At times during the day I felt like I myself was running on fumes alone, but they carried me along! Boxy Stars is such a great class for clearing out 2.5” strips, for making good use of the scraps, giving you a quilt that looks a lot more intricate and difficult than it is ---it remains a favorite in all color ways! Boxy Stars – free pattern found under the free patterns tab! It’s the perfect time of year for trying some in halloween fabrics! Standing room only crowd at my lecture! Today I’m feeling much more in my own home time zone, and a Pineapple Blossom workshop awaits! When I first looked at the Boxy Stars pic, I didn't see the star, it kind of reminded me of opening flower petals. Now I see the star, and I think the star points show more if the outer boxes are a more neutral color, but the darker colors bring the flower effect. Pretty cool! Last night lecture was spectacular!! Thank you fr laughs, education and inspiration - can't wait for my Saturday class!! Thank you Bonnie for enthusiastic lecture last night when you must surely have been tired!!! I am looking forward to Crumb class tomorrow! Have a beautiful day !!! it always amazes how you can completely change a block by color placement. i don't have the artistic gene for the color vision. the color wheel is like math to me, total mental block. Boxy Stars and Pineapple Blossoms are some of my favorites from your free patterns. I never get tired of seeing other quilters' unique interpretations. Nice work, Amherst quilters! Love the Halloween blocks! I'm in the process of making a Halloween quilt using the Twister ruler. Waiting on my outer border fabric to arrive. Every once in awhile I think you must be crazy to do what you do. Your schedule is beyond belief, but it looks like so much fun. Thanks again and again for sharing. Guess I should pay closer attention to your schedule. You were only about a half hour or so from where I live! !